If you think you have been washing clothes for longer, you need to relearn, because you are now a PARENT! When you are a new mom, you realize that doing heavy loads regularly become a norm, as tiny toddlers bring a pile of washing clothes. They spit up, drool, poop and leak in a way that even the most secure diapers become of no use. The reason their stained bibs, burp clothes and sheets, untidy cribs, towels plush toys, and other stuff needs constant washing. And with all this, you are most likely to be amidst in loads of laundry. 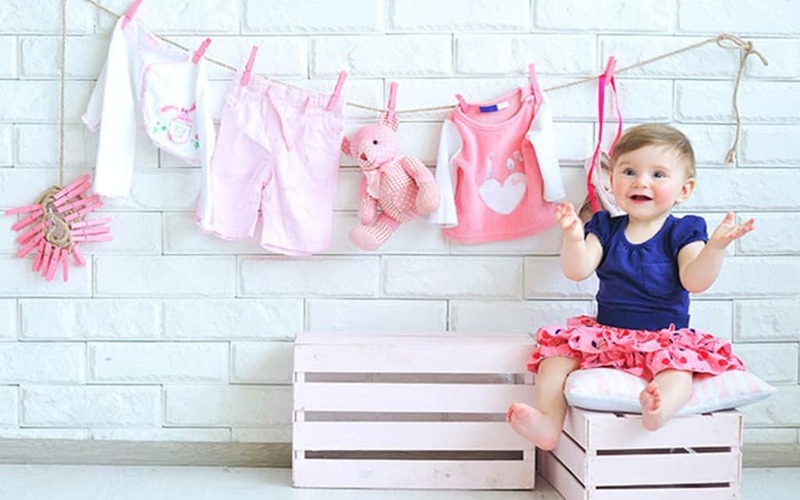 Washing baby’s clothes even before they arrive, is a must for going-to-be mom’s! Kid’s skin is super soft and sensitive, thus need special care and attention. Further, the market brought clothes are sprayed with chemicals like formaldehyde, which restrain their new look and keep them wrinkle-free. So, before putting it on your kid, soak it in water till they become soft. You can use soft and mild detergents or can get free baby stuff detergent to test them before. Avoid using fabric softeners, as they can reduce the effectiveness of the clothes and can cause irritation of your little one’s soft skin. When the clothes start staining, that’s when the real laundry game begins! Everything from cereals to veggies and fruits will be on your baby’s clothes, no matter how many bibs and covers you use. Oh, and, there will be lotions, powders, and oils as well on them. Therefore, removing these stains becomes the tedious task. If this is happening, put the stained piece immediately in the water with a layer of stain-resistant or cleaners over it. Use liquid detergents than the powder ones, as they work better for food stains. Note: Do not drain the cloth, until you are sure that the stain has been removed. Pick A Fragrance-Free Detergent: There’s a difference between fragrance –free and unscented detergent. Fragrance-free means that kid’s detergents don’t have any fragrance, however, the unscented means that the fragrance is masked. Unscented detergents can irritate baby’s skin, so avoid them. Chemical-Free Or Plant-Based Detergent: Pick natural cleaners as they will not discomfort your baby’s skin. Natural detergents are laden with all-plant-based ingredients that are best for the environment. Before putting your baby’s stuff in the machine, do a machine-cleaning. After all, cleaning your toddlers clothe in a bacteria-filled machine doesn’t make any sense. You can use a mild cleaner with some water or can also use baking soda and vinegar to ensure the cleaning. Do clean the rubber lines as they tend to collect the mold in them. Make a thick paste of baking soda and water and scrub them thoroughly in the machine drum. Once done, clean it with water and then put clothes. Baby will dribble, even if they have eaten everything without spitting anything on the clothes or bibs. So, keep baby’s laundry wipes in hand to attack stains. Use the disposable laundry wipes as they will keep your child stain-free. Besides, you can also make your on-the-go stain-treater from the detergent and spray bottle. Just mix the one part of water with three parts of detergent, and your easy stain-remover will be ready. Having a cloth hamper will make traveling with tiny, little clothes easy. Also, it will keep things sorted, and you will be able to keep colored and whites separately. So, those were some of the laundry tips to look when doing baby’s laundry. Keep them in mind and minimize your washing load!